The steam turbine locomotive was a variant of the steam locomotive and hailed at the time of its development as not only extremely efficient and powerful (which it was) but also that it could compete with the diesel locomotive in becoming the railroad industry's primary main line locomotive. However, while powerful the design was only efficient at very high speeds and was a maintenance headache for the few railroads which did test them. In all just the Union Pacific, Pennsylvania Railroad, Norfolk & Western, New York Central, Great Northern, and Chesapeake & Ohio ultimately tested designs of the steam turbine locomotive, which lasted just a few years on each railroad. By 1958 the N&W had scrapped its "Jawn Henry" design and the steam turbine was relegated to history. Today, no examples of this unique design are known to exist. The steam turbine locomotive was developed in the late 1930s as a means to compete with the diesel. By this point EMD had successfully demonstrated the usefulness of its E and F series diesel locomotives and the steam turbine seemed to be the last hope of retaining that means of propulsion in main line railroading. In a comparison to steam locomotives only the steam turbine was meant to be more efficient while requiring less maintenance due to fewer moving parts. This was because the design did not have large driving wheels, side rods, or pistons like a standard reciprocating steam locomotive. Instead, its running gear was much more similar to a diesel locomotive using traction motors and trucks to house the wheels (except for the PRR's model which did use a more conventional steam locomotive wheel arrangement). The steam turbine had plenty of advantages but unfortunately had just as many disadvantages. Aside from having fewer moving parts the design did not have to contend with the difficult task of being properly balanced. Likewise, the locomotive did not suffer from wheel slippage when attempting to start from a dead stop. However, the design was only efficient at very high speeds, usually over 75 mph and at slow speeds used massive amounts of fuel (coal) and water. Additionally, the turbine an only be operated in one direction requiring an additional unit to be operated in reserve. Finally, the design proved to be a maintenance nightmare as the unclean environment in which railroads operated was simply not suited for a turbine. 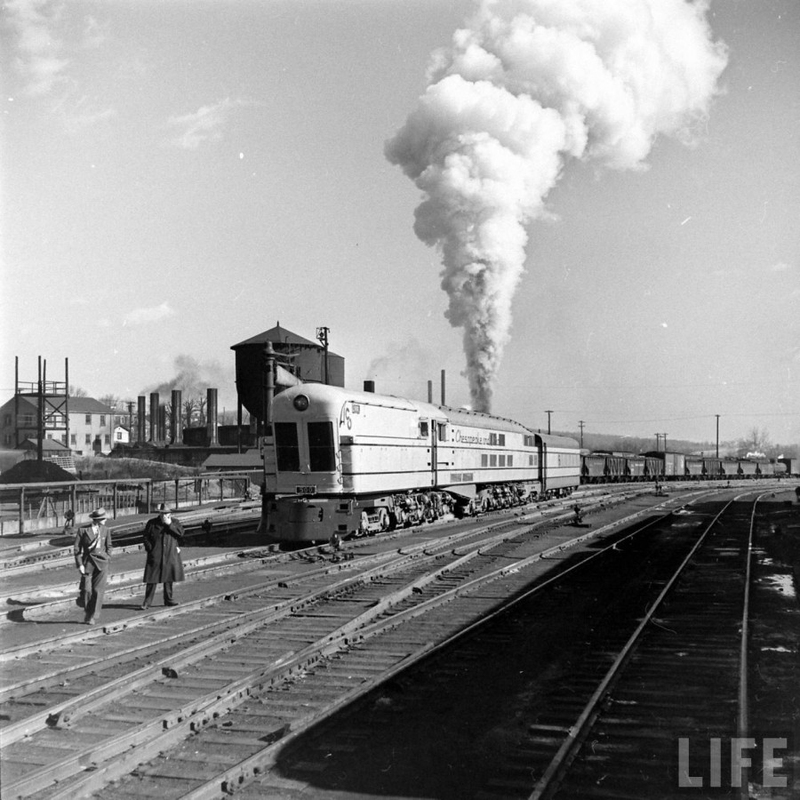 The first steam turbine locomotive design was built by General Electric in 1938 and tested on the Union Pacific. The two test models carried an electric locomotive-like 2-C+C-2 wheel arrangement. To give you an idea of what this means, in the case of a 1-D-1 wheel arrangement; the “1” refers to one unpowered axle located on each end of the locomotive and the “D” refers to four powered axles whereby “A” equals one powered axled, “B” equals two powered axles, “C” equals three powered axles, and so on. While at first these classifications look tricky they are actually quite simple once you know what they mean and stand for. They were the only two steam turbine locomotive design to feature condensers and apparently worked relatively well. In any event, they were only used on the Union Pacific for about six months and were later sent to both the New York Central and Great Northern. The GN used them throughout 1943 and returned them to GE needing new wheels. They remained sidelined at GE and were eventually scrapped. A year later, in 1944 the Pennsylvania Railroad unveiled their steam locomotive turbine design the Class S2, #6200, developed by the Baldwin Locomotive Works. It featured a traditional steam locomotive wheel setup in the 6-8-6 arrangement. The model could produce an astounding 6,900 horsepower with a starting tractive effort of 70,500 pounds. However, it consumed large amounts of fuel and water and low speeds and proved to be uneconomical. The PRR would eventually scrap the #6200 by 1949. 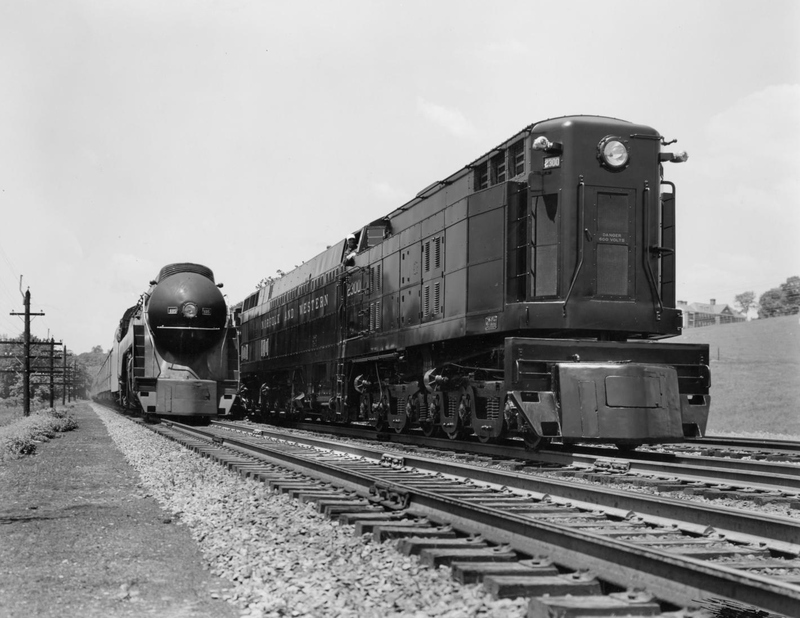 A year after the PRR first began testing its Class S2 the Chesapeake & Ohio Railway unveiled its Class M-1 in 1945, developed by both Baldwin and Westinghouse. This design carried a unique albeit odd 2-C1+2-C1-B wheel arrangement and was streamlined for premier passenger service across Virginia, West Virginia, and Ohio. It was capable of producing 6,000 horsepower and the C&O eventually would come to own three, #500 through #502. The steam turbine locomotive weighed an incredible 428 tons making it very hard on the track. Once again, this design proved to be quite troublesome, constantly breaking down due to water leaking on to the locomotives' traction motors and coal dust clogging the front motors. 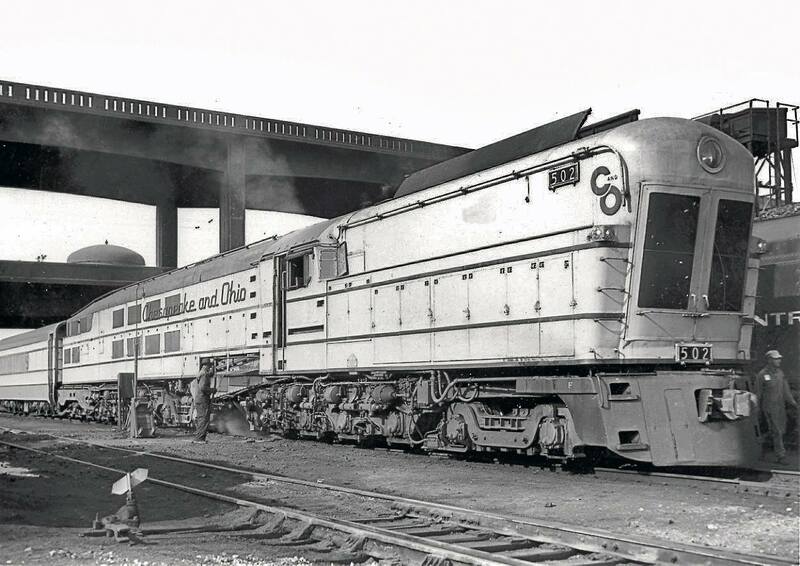 By the summer of 1948 the C&O had scrapped all three of its steam turbines. Finally, in 1954 the Norfolk & Western Railway tested its "Jawn Henry" design, #2300, named after the famous African American worker who defeated a steam drill. This design featured a C-C-C-C wheel arrangement and could produce nearly 5,000 horsepower. Like nearly all of the designs it was quite heavy at 409 tons but produced the highest tractive effort at 175,000 pounds. Even as the master of steam technology, the N&W could not work out all of the problems that cropped up with its steam turbine locomotive. Within four years of its debut the "Jawn Henry" was scrapped by the railroad.